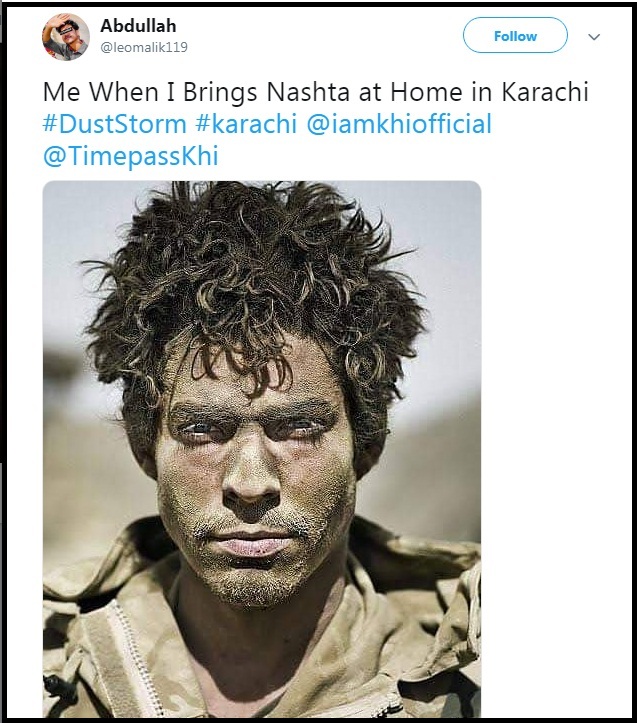 The Recent Sandstorm In Karachi Has Proved To Be Very Dangerous And Ya Allah, Reham! 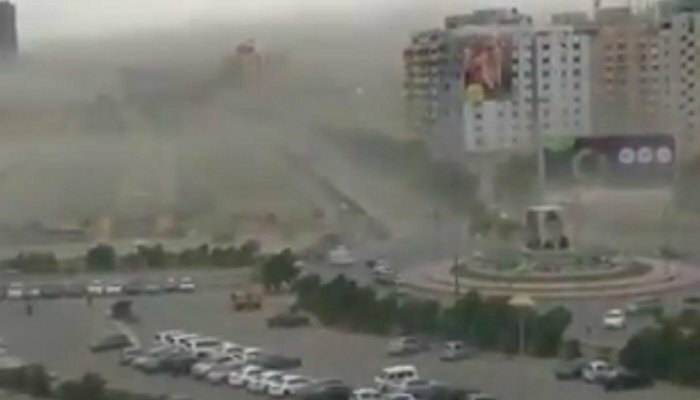 An intense dust storm hit Karachi accompanied by strong wind on Sunday night and continued Monday morning dispersed sand across the streets and downing trees. A few days ago, Pakistan Metrological Department has predicted rain along with dust and thunderstorm in Karachi on Monday. The storm dropped down the temperature providing Karachites second day of pleasant weather. On the other hand, multiple airlines halted their flights from Jinnah International Airport as the dust storm reduced visibility. The howling gales ripped off the tin walls, trees, poles and knocked out the power cables in some localities of the city. There are several reports of injuries and damage in the city to which the rescue teams responded immediately and cleared the roads from downed trees and poles. However, Netizens Are Enjoying The Weather While Watching Game Of Thrones! So, It Was An Advertising Stunt? 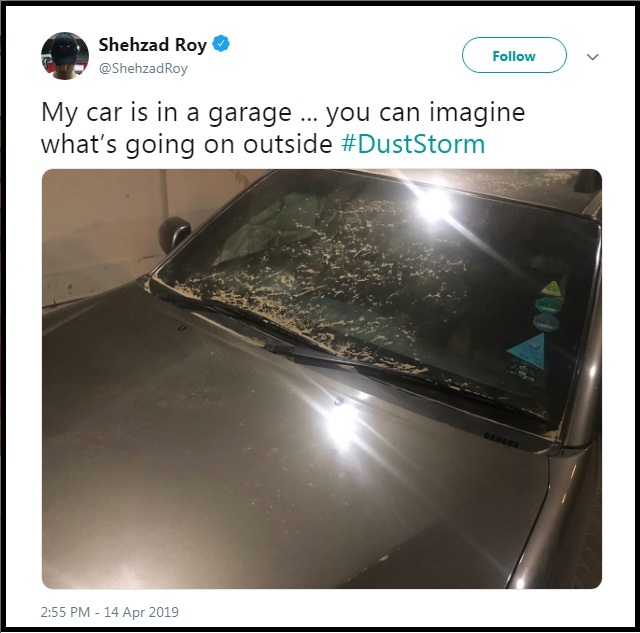 Shehzad Roy Tweeted A Picture Of His Car That Was Parked In His Garage Yet Covered In A Lot Of Sand! 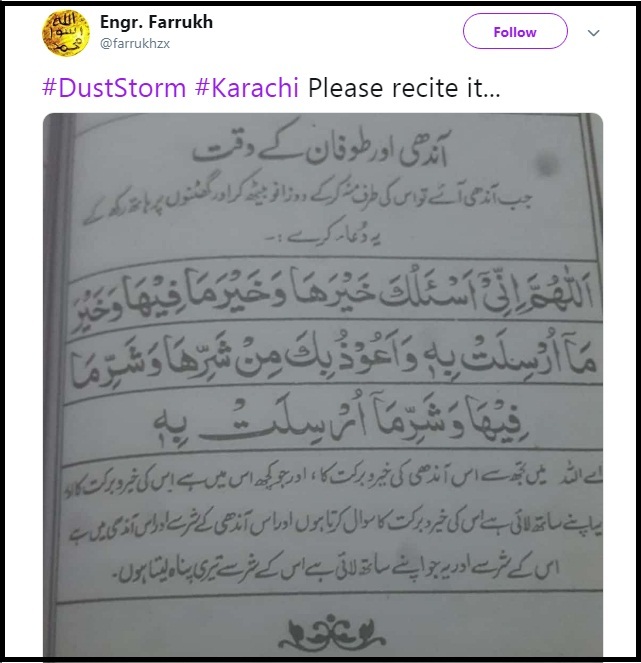 People Are Sharing Prayers To Be Recited In The Dust Storm! There Are Many More Videos On Social Media! OMG! Window Cleaning Trolley In Air! 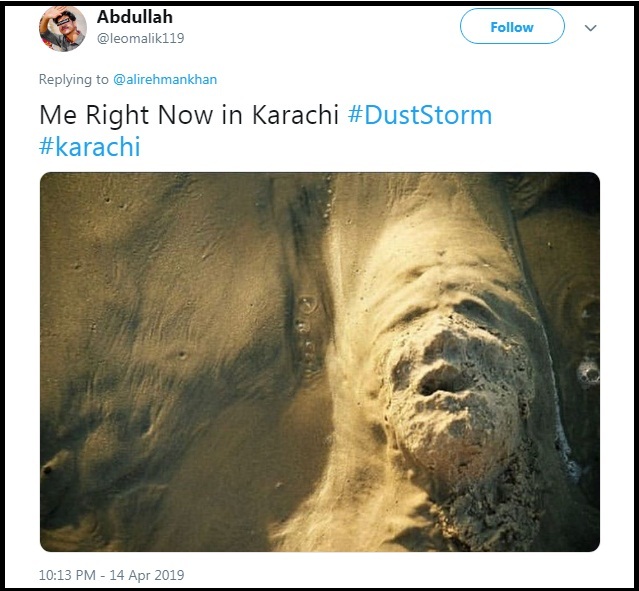 According to a local news channel, three people lost their lives and twenty got severely injured due to dust storm and wind in Karachi. The incidents of wall and roof collapse have been reported in Korangi, PECHS, Malir, and Surjani Town. PMD Director Sardar Sarfaraz said there was a likelihood of rains falling in Balochistan from Monday to Tuesday and at scattered places in Sindh’s Sukkur, Larkana, Shaheed Benazir Abad, Hyderabad, and Karachi divisions on Monday and Tuesday.